Home > British Isles > 1570 Septentrionalium Regionum Descrip. This is an example of the first state from the earliest edition of Typus Orbis Terrarum, published by Abraham Ortelius in 1570. The map is identified as such by the Latin text on the verso and page number 45. 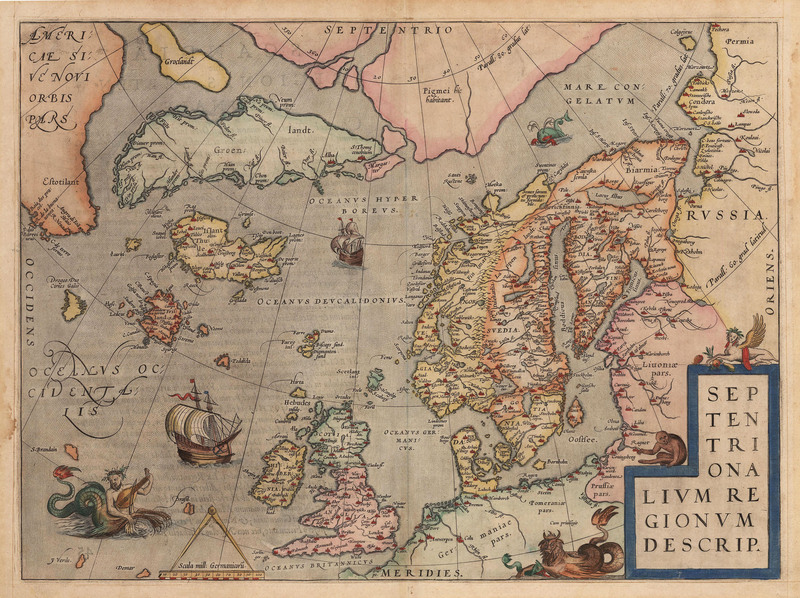 Ortelius depicts a large area of the North Atlantic, extending from Scandinavia and the Polar regions in the Arctic Circle and in the East, to the mythical islands of Drogeo, Frisland and Icaria. Also included are Greenland, Iceland and North America. This map was influential in its treatment of the Arctic regions. Engraved by Frans Hogenberg, the map shows the influence of Mercator’s wall map of 1569, as well as other works of the era. The outline of Scandinavia is impressively accurate, bordering the Mare Congelatum, Latin for the ‘frozen waters of the Arctic’. Latin text on the verso provides descriptions of the various regions and countries covered by the map. The map is embellished in the usual style of Ortelius, with a variety of sea monsters and mythical creatures, including one half-man half-seahorse playing a an early cousin of the violin, and another creature combining aspects of a lion, a buffalo and a sea serpent is depicted with holding its live prey with its paw. Two lovely frigates also grace the seas. Condition: This hand colored map is in B condition. One worm hole to the left and right of the centerfold at the bottom of the map. Light water staining confined to portions of the left and right margins. The map has been repaired with archival materials on the verso.